U.S. Transportation Secretary Ray LaHood announced Monday a combined $776 million for urban and rural transit providers to help bring buses, bus facilities and related equipment into a state of good repair. Money from the Federal Transit Administration’s new State of Good Repair discretionary grant program will go to 152 projects. 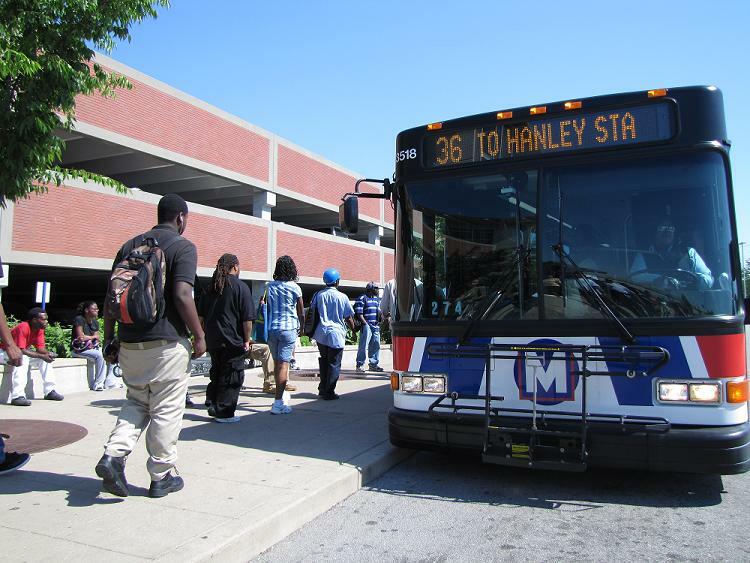 Metro St. Louis will receive $3 million from the State of Good Repair Grant for transit vehicle replacement. The vehicle replacement program in St. Louis aims at replacing vehicles in the fleet as they reach 14 years in service. For two years the Agency was unable to replace aging vehicles in the fleet. As a result of the passage of Prop A, Metro was able to initiate two orders for replacement vehicles totaling 50 buses to be delivered in mid- to late 2011 and an additional 51 buses to be delivered in early 2012. The new $3M will support future bus replacements in accordance with Metro’s bus replacement schedule. Metro expects to place the next bus order by early 2011 with an expected delivery date in 2013. “With this latest federal investment, the vehicle procurement and maintenance program is back on track,” says Metro Chief Operating Officer Ray Friem. New buses come equipped with such amenities as on-board security cameras, low-floor kneeling mechanisms, and GPS technology. This will also mean that several thousand well-paid tradesmen and women will keep their jobs for at least the next four or five years. Good news all around. I am awaiting the new buses in 2011 and 2012. MCT is expected to receive new buses as well. With the new buses coming for the St. Louis side, will they still look like the old ones from 2008 or will they look even more different. I know MCT has changed the way they’re new buses look. They should look the same – We have a 5 year contract with Gillig and these buses are being purchased under that contract. There may be minimal changes that the passenger will notice such as flooring and seating and other functionality changes that the passenger will not see – these do not change the model styling. The model will remain the same. Thanks! I forgot to add this in my post above. Is metro planning on receiving ne Light Rail Vehicles to replace the original 30 from 1993? They aren’t really that old but I was just wondering if I will see a train pull up that is numbered 5000 or something. Here’s your answer regarding LRV trains: Typically, the expected life of a light rail vehicle is 25 years so the expected lifecycle for the 1000 series ends in 2018. To assure the LRVs are fully functional over their lifecycle we continuously maintain/overhaul or upgrade as appropriate all the critical subsystems on the trains. These trains run to well over a million miles. So, to get the most out of the money spent on them, they will be used for their lifetime. They will soon be getting fresh coats of paint, however. If you guys are going to be getting new buses, might as well retire the old look we currently have and get nicer looking buses that look less serious with an entirely new look (get rid of the red white and blue colors). I agree with Dennish H, it would be nice to have sleeker modern 21st century looking trains. If you want to maximize the ridership you have to make it look like it is something people want to ride. The 3500s are the Advantage model which is what alll Gillig makes. They used to build the Phantoms which are the 9500s, 9600s, 2000s thru the 3400s. I love Gillig and I hope Metro extends the contract with Gillig. Gillig is very creative. So is Siemens. What I have learned in Dallas in 1999, the way you attract customers is to make the design to how the customer wants it! Amtrak has learned from their customers that they like the bi-level Superliners. The engineers love the new Genisis engines because they are quiet on the inside, both the seats and dash are plush. We have to make sure that one gets put onto the #48 Lindbergh that leaves Catalan Loop a 5:10 AM headed to the Ballas Transit Center. One of my friends who works with me prefers the low-floor bus over the regular high-floor bus. He catches the 3:41 bus heading back home in the evening. Make sure that run gets assigned a new low-floor bus once it arrives. Other lines where the low floor buses would be hot items on is the #17 Oakville and the #46 Tesson Ferry. I hope Metro doesn’t take this post the wrong way but, I honestly think that the 95 and 96 series Gilligs are too old to be on Highway routes such as the 258 Clayton-Chesterfield Airport Bus. I rode a 96 series bus to Chesterfield Mall and I didnt enjoy my ride at all. When I’m in St. Louis, I love to ride the 1 Gold and 2 Red on the 35 series buses. They are so comfortable. I hope the old ones get replaced soon. Also, in the new order, will there be 60 foot buses includes as well for some of the heavily populated routes lke the 70 Grand. I do not like riding that route period.